Christopher Eccleston, the English film, stage and television actor stands in solidarity with Burma’s political prisoners. For Amnesty’s campaign using my work to raise awareness about Burma’s political prisoners they have been working hard to secure celebrities to be photographed and I was particularly pleased to meet Christopher Eccleston as he starred in one of my favourite films of all time “28 Days Later” and has just appeared on screens as one of my and no doubt your all time heroes, John Lennon, in “Lennon Naked“. We met up in a private dining club in London’s Soho district back in August and it was great to be able to have time for a chat rather than just taking the portrait in few seconds before leaving. 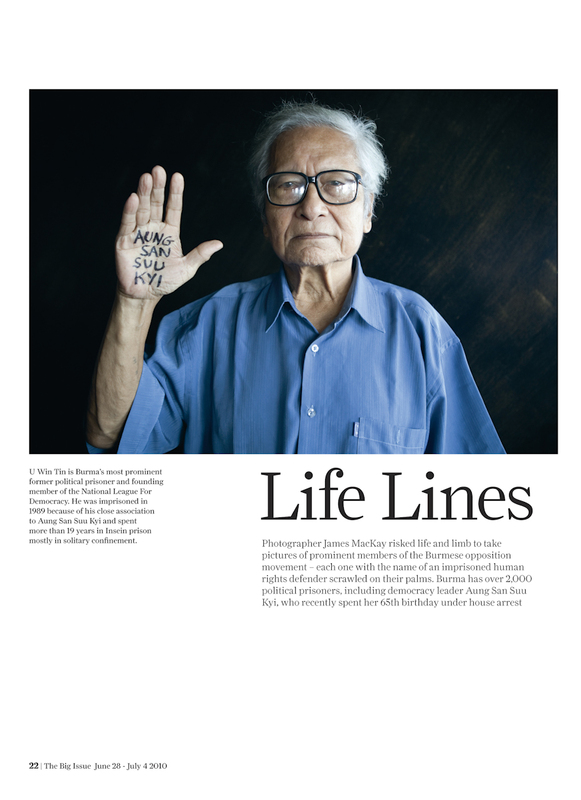 What a really great guy who was not just totally engaged in the idea of my work but more importantly in the issue of Burma’s political prisoners. A huge thank you to Christopher Eccleston on behalf of Burma’s political prisoners. Due to the way Amnesty International works with the celebrities it approaches (and the limited time celebrities have) they also get them to do other promotional work at the same time supporting other Amnesty campaigns or Amnesty in general including photographs with placards etc and so Amnesty use their own photographer. Unfortunately whilst it means I may not be able to photograph all these celebrities (I’m also often away as you can see) it’s just the way Amnesty work and it works with their campaign which is somewhat seperate to this long term documentary project that we are working on here with the political prisoners. This does however often leave me with the opportunity to discuss Burma and political prisoners with the celebrity when I am free to attend these shoots and that after all is more important than a photograph. The actual portrait of Christopher Eccleston was shot by Amnesty’s photographer Leo Cackett … or is that really me after all? From Rangoon to London. One Underground to Another. Picking up from where we left off with Zaw Zaw Aung the other day we continued with shooting in London’s famously fashionable Shoreditch district, although this time we went underground. After all that is where political prisoners roots are and none more so than my friend Aung Gyi who it was a great pleasure to catch up with and take his portrait. Special thanks as always to DVB for filming and Jacqueline San for making this happen. In 1988 Aung Gyi was a high school student at BEHS3 in South Okkalapa township in Rangoon. He was Secretary of the South Okkalapa division of the student organization the “Democratic Front” and was heavily involved in organizing and carrying out actions aagainst the regime such as leafleting and dropping pamphlets, putting up posters and banners and graffiti on walls in busy areas. Along with most of the colleagues in his group he was arrested at home one evening in August 1990 and ended up being charged under section 5J and was sentenced to 5 years in prison. He spent two years in Insein and Taungoo prisons before being released in August 1992. After his release he rejoined his colleagues in the movement for underground activities. He was involved in the 1996 student demonstrations but he managed to escape being caught by the authorities, unlike many of his colleagues who were returned to prison. He spent 3 years in hiding in a poultry farm in an area just outside of Rangoon. Whilst he was in hiding he got married – a quiet, secretive wedding ceremony in a small monastery. In 2001 he started working as a reporter for a Rangoon sports journal “First Eleven”. He worked with Zaw Thet Htwe who was chief editor at that time. In 2003 Zaw Thet Htwe was arrested for an article that had been written about alleged corruption in the Burmese football association abusing money given to them by the world football governing body FIFA. Zaw Htet Thwe was arrested and sentenced to death and Aung Gyi was also arrested but this time was released after interrogation. In 2005 he was contacted again by some of his former collegues who had now been released from prison with the aim of starting up a network of undercover journalists inside the country and the first DVB networks were established. Aung Gyi left his sports journal job and set up his own advertising and film editing company, again helping to provide a cover for his secret activities now as an undercover video journalist. In 2007 he was involved in the Saffron Revolution and with the footage that the world would see provided by the network of Burma VJs the authorities were hot on his trail and he was arrested again in November 2007. His arrest was a farcical story, but I cannot share that with you here. He was detained for a year before being sentenced to 2 years in prison. He was released in September 2009 from Shwebo prison. It was now too dangerous for him to stay in the country anymore and with his wife and young child he fled Burma on 1st January 2010. He has now been resettled to the UK but like so many former political activists who flee, he is left waiting for his family to join him. One has to spare a thought and thank Than Shwe for disbanding Burma’s once famed intelligence network in 2004 which lead to the jailing of hundreds of intelligence officers (two of whom Aung Gyi was jailed with in Shwebo prison) and the detention of General Khin Nyunt under house arrest. If the intelligence services had been left with their previous powers then not only would Aung Gyi still be in prison today, but so would so many of his colleagues and no-one would have known anything about the ‘Saffron Revolution’. Burma’s Prime Minister-in-exile and Chairman of the NCGUB, (National Coalition Government of the Union of Burma), Dr Sein Win, joined the campaign adding his voice to thousands around the world standing in solidarity for Burma’s political prisoners. Dr Sein Win, cousin of Aung San Suu Kyi, was born on the 16th of December 1944 in Taungdwingyi. His father was the elder brother of General Aung San and was part of the cabinet of Aung San – he was assassinated in 1947, together with Aung San and most members of the cabinet, just before Burma gained independence. After the 1988 uprisings, Dr Sein Win was the Treasurer of the Information Department of the NLD and in charge of the Party for National Democracy (PND) and was elected Member of Parliament for Paukkhaung, Pegu Division. On 1st October 1990, in the aftermath of the election, a Special Leading Committee consisting of elected MPs and party members secretly met at a location on the Mandalay-Maymyo road and endorsed resolutions that were instrumental in the formation of a parallel government. Two elected representatives were sent to the Thai side to contact with the revolutionary forces and got their support. Several MPs headed by Dr. Sein Win left Burma for Manerplaw to form a government on the Thai-Burma border. The National Coalition Government of the Union of Burma was officially formed in Manerplaw on 18 December 1990 with Dr Sein Win elected as Prime Minister. One of the declared principles was that it would be dissolved once democracy and human rights are restored in Burma. Take action NOW at the Amnesty UK website to demand their immediate release. Finally, after many months hard work behind the scenes with Amnesty International as well as two years hard work on the road, today this project is officially becoming part of a major campaign action by Amnesty International to demand the immediate and unconditional release of all Burma’s political prisoners. This is a campaign action that YOU can be part of. TAKE ACTION, stand with Burma’s former political prisoners and demand the release of ALL of their colleagues who remain in jail today. 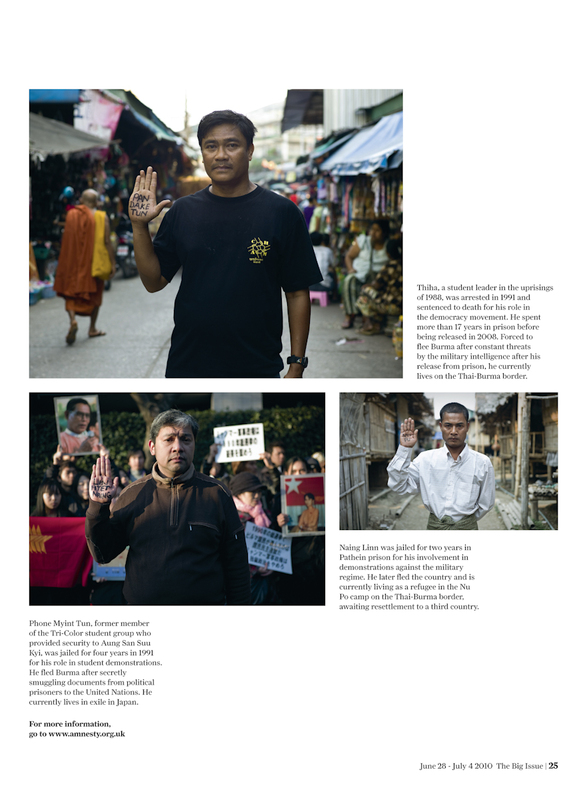 This campaign film is being used to launch the start of this major campaign by Amnesty International UK and we need you to play your part in placing insurmountable pressure on world leaders and the UN to bring about the release of Burma’s political prisoners. The campaign is being lead by the former political prisoners themselves but WE NEED YOU to stand with them. With this campaign we aim to collect thousands of portraits from people all over the world and put pressure on world leaders at the EU-Asia summit in October just days before the elections will be held in Burma. Please visit the Amnesty UK website for full details. Everyone at AAPP and DVB and others who’s names I cannot mention; Jackie San (for filming everything); Verity & Laura at Amnesty UK; Paul & Tim at Handcrafted Films; but most importantly of all, I would like to thank the former political prisoners themselves who have taken part and those who I am yet to meet. Without you there is nothing, but with you there is everything. I will not stop until your colleagues are free. Dateline London once again and despite knowing Ko Zaw Zaw Aung for some time, finally we manage to meet to chat and take his portrait. That’s the problem with constantly being on the move. Zaw Zaw Aung was a Rangoon University student when he was first arrested in March 1988 at the Phone Maw incident when he was detained for one week. Along with his colleagues, Htay Kywe, Min Zeya and others from the 88 Generation Students they re-formed the outlawed ‘BaKaTha’ student movement in the build up to the 1988 mass uprisings – and now it’s re-forming saw the birth of the ABFSU with Min Ko Naing installed as it’s president. The ABFSU or BaKaTha was formed in the 1920s and subsequently led by General Aung San. It has been at the forefront of the independence and pro-democracy struggles in Burma. Along with his colleagues as one of the students leading the demonstrations he was arrested on 27th July 1989 and under sections 5(J) and 17(1) he was sentenced to 10 years in prison on 5th November 1989. He spent 2 years in Insein prison before being transferred to Tharawaddy prison where he served his full 10 year sentence before being released in November 1999. After his release from prison all he knew about were his previous political activities, but continuing them was virtually impossible due to constant surveillance and harassment from MI. He started working with his colleagues doing welfare, health and social programmes for political prisoners’ families. He was a founder of Pyinnyar Ahlin Yaung school in 17th District in South Dagon which provided education and welfare to 400 students including 150 orphans. In 2004 when Min Ko Naing and other student leaders from the 1988 movement were released he was able to join up with his colleagues in forming the 88 Generation Students which was officially formed in 2006. He worked alongside Ma Phyu Phyu Tin (NLD) providing care and assistance to HIV sufferers for more than 18 months. But faced with the ever-growing threat of being arrested once again he was forced to flee Burma – having already spent 10 years in jail he couldn’t face suffering the torture, abuse and mental and physical suffering he previously endured in jail so was forced to flee to the Thai-Burma border in November 2005. Like so many before him and so many still today, the inhumane treatment of political prisoners by the SPDC is in clear breach of the UN’s Declaration of Human Rights in so many ways. Article 9 clearly states that “No-one shall be subjected to arbitrary detention, arrest or exile.” Yet again the case of Zaw Zaw Aung shows clear abuse of his human rights for all of these three things. At Mae Sot he worked at AAPP before applying to join the UNHCR re-settlement programme. He spent over 1 year in Nupo refugee camp before being re-settled to the UK on 19th October 2007. The gauntlet has been well and truely thrown down by the British Government – Foreign minister Jeremy Browne MP stands in solidarity with Burma’s former political prisoners demanding the unconditional release of all of Burma’s political prisoners. He had previously had his photo taken whilst speaking at Amnesty HQ last week but I managed to arrange a 30 second photo shoot (and a slightly longer chat!) after the briefing given by British Ambassador to Burma, Andy Heyn. The room was about a s dark as cell in Insein but we did our best and even managed a bit of undercover filming from DVB without anyone knowing… no change there then! Burma’s political prisoners are officially The Big Issue. A great UK magazine (for what it stands for) has published a four page article featuring 10 portraits from the campaign and also the chance for all to see some that haven’t been seen before (I’m always trying to vary them as much as possible, but so far picture editors seem to be consistent in their choices to publish out of the 170 available!). Today an exclusive coup as British Foreign Minister Jeremy Browne joined the campaign to free Burma’s political prisoners. Standing with Amnesty UK Director, Kate Allen, he wrote the name of Mie Mie on his hand and stood to show his solidarity with the former political prisoners who are leading this campaign. Mie Mie @ Thin Thin Aye, a member of the 88 Generation Students, is currently detained in Katha prison serving a 65 years sentence. Kate Allen had the name of 88 Generation Student Htay Kywe written on her hand. He is also currently serving a 65 year sentence in Buthidaung prison. Click on the Foreign Office website to read more. Just before the exhibition launched on Monday evening Radio Free Asia (RFA) did an interview with me about political prisoners and Kate Allen, Director of Amnesty International UK, also joined us. Thanks to Ma Aye Hnin Nyo for the interview – it was broadcast back into Burma on 24th June.